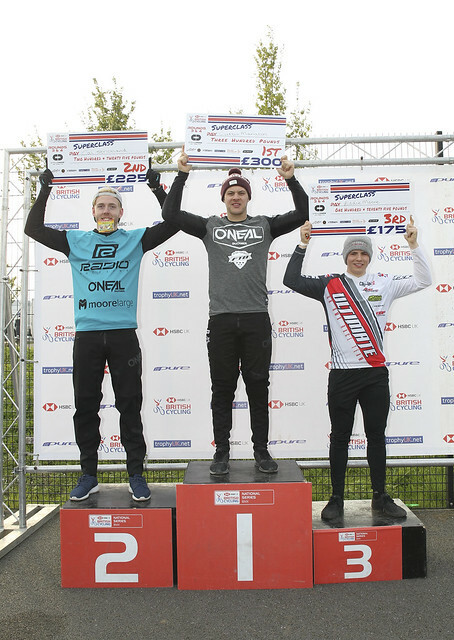 Beth Shriever and Curtis Manaton dominated their competitions at Cyclopark, Kent for rounds three and four of the HSBC UK | National BMX Series. It was business as usual in the championship women’s class with Bethany Shriever and Charlotte Green dominating their class once again over the weekend. Shriever took full control of the final and despite a strong challenge by Green took a commanding win, with Green scooping second. Emily Hutt, despite being only 14 years old, stepped up to championship women class in Manchester for rounds one and two, where she didn’t have the best of luck. The youngster, however put on a fine performance, underlining her talent and taking third both days. It was Curtis Manaton all the way this weekend, as the FTB - Moore Large rider took back to back wins in the mne's superclass competiton. With most of the superclass riders missing, getting ready for the upcoming rounds one and two of the UCI BMX World Cup in Manchester; it was up to the remaining six riders, Manaton, Ed Strickland, Ed Moore, Paddy Sharrock, Dean Reeves and Ashley Binner, to give the crowds something to cheer for. In the final round of the day, it was Manaton who took the hole shot, with Eddie Moore matching him pedal stroke, for pedal stroke. Into the turn, Ed Strickland made a move, slicing his way past Moore as Manaton headed for home. A final charge by Strickland pushed Manaton all the way to the line, but Manaton remained undefeated, with Strickland claiming a close second and Moore bringing home third. By far the most exciting and most talked about racing of the weekend though has to go to the junior men, a new class for 2019, who put on a tremendous show of talent in some fiercely contested motos. Matthew Hutt, brother of Emily riding in the championship women class, did the family proud taking the win in the final of round four. From the gate he found himself in third spot, behind Jay Bovill and Nathan Wood. The wind was strong coming into the pro section on the second straight which seemed to stop the riders dead. None of them seemed to make the jump, leaving Hutt to make his move on the final berm taking control of the race into the final straight and the eventual win, with Bovill and Wood coming in for second and third. Tyreese Bradshaw and Chad Hartwell, first and second at round three on Saturday, both made mistakes in the final of round four. Bradshaw at the end of the first straight and Hartwell at the beginning of the second straight, both did well to stay on to finish the final and to grab some points in the overall comeptition with eight rounds remaining.